Watch out: The jock in me is about to be unleashed. I never would normally do this, but it’s been 28 frickin long years and I’m so tired. So, so tired and delirious. I’ve been watching the Philadelphia Phillies playoff and World Series games for what seems like my whole life the past few weeks. With this crazy election coming up, I have agita and sleepless nights even thinking about how close the race even is. I’ll feel like I’ll finally be able to sleep on November 5th (fingers crossed). Regardless, I’m going to celebrate the Phillies first World Series win since 1980 by linking you to all of We Are Never Full’s posts about Philadelphia (and South Jersey)-related foods. 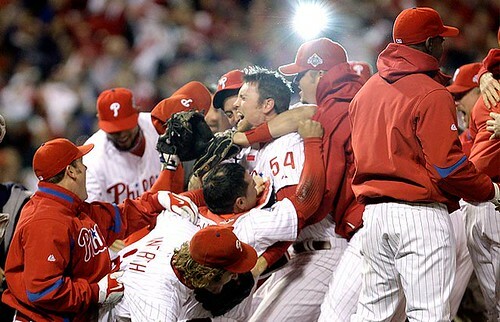 GO PHILLIES!!!!!!! PS: I promise to never do another non-food related post again. Unless, of course, the Eagles pull off a miracle this year. I had no idea that you guys were Philly fans? and from South Jersey! I thought you were New Yorkers. We are Mets fans, being from Queens & Giants fans living in NJ. At least we have one winning team! (super bowl 2007). I have seen Met games at the new Philly stadium, a great place. Congratulations. Not sure if Amy or Johnny wrote the post! But am happy for you! i know, i know… god i think being a cubs fan is the worst since they’ve been sooooo close before! and, maybelles’s mom – i forgot the in the Indians were even a team, so it’s got to be long! Stacey: I’m from Philly originally… moved to NYC 10 years ago. Jonny’s a Brit so he just started understanding baseball when he moved to America 5 years ago. I consider myself a New Yorker to a certain extent (I think the “rule” was you had to live here at least 10 years) butI’m still a Philly girl at heart. The new stadium is awesome… AWESOME! I was going to do a whole post on the food available at our new stadium but didn’t get enough pictures. Thanks for the nice comments – still on a high! How bout those crab fries at the new stadium? They are disgusting! They have old bay seasoning on them! (at first, this dummy thought they had some sort of CRABMEAT in them! duh!). See, your blog post is STILL about food. The rule about being a New Yorker, is you had to be born in a borough, and go to grade and/or high school in NY, then the title never leaves you! Yay, Phillies! Now, let’s go Iggles. I feel your pain with all the election agita too. Not a good time for high blood pressure! Yeah that’s a long time to wait! Congrats Philly…the ghost of Mitch Williams is now gone! I was soooooooo happy! I did the happy dance right here in my den. Hell, I remember the last one. I was home in Philly dancing in the streets.